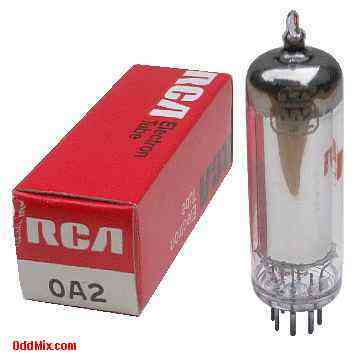 This is a genuine, discontinued type RCA cold cathode 0A2 (Neon) Gas Voltage Regulator Stabilizer Electron Tube in it's original box. A rare antique, hard to find, classic collector's special vacuum voltage stabilizer tube. At one time these tubes used in many special circuits, old time receivers, transmitters and transcievers. Excellent for those antique radio restoration projects or to set up a private vacuum tube museum. This is a genuine RCA NOS New Old Stock, new, unused, excellent condition.